The cold weather has put me in a fur or faux kinda mood. Admittedly, I'm addicted to soft, furry things (real and faux). While some of my favorite apparel and accessories this season are fur, I often opt for a less expensive faux version. Everything is fur or faux this winter; from coats to gilets and bags to shoes, you can don this trend just about anywhere! I especially love little fur details on boots and shoes - it's unexpected and fun. I'm also partial to neutral tones that lighten up an otherwise dark season for apparel. 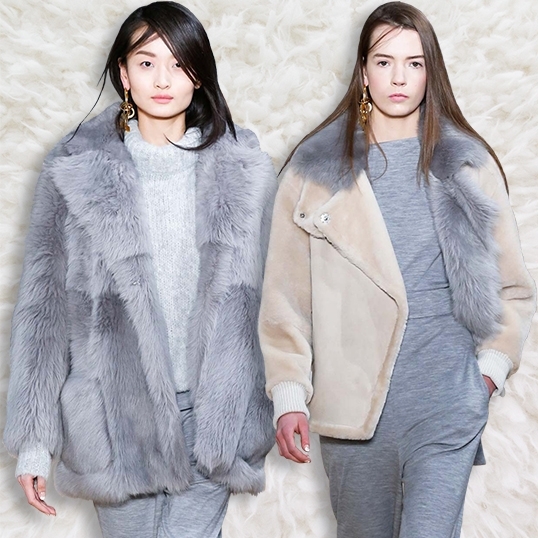 Here's a montage of fur and faux items to inspire your fashion choices this winter. Pictured here: (available at NET-A-PORTER) Fendi Peekaboo shearling tote, Zara faux fur stole, ear muffs and snood, (available at Mytheresa) Stella McCartney faux fur gilet, Mango faux fur coat, Fendi fur bag charm, (available at NET-A-PORTER) Stella McCartney faux fur tote - available in two sizes. The arctic winter climate in Montreal calls for layers of shirts, sweaters and of course, fashionable fur! Pictured here: Elizabeth and James Bianca rabbit and coyote fur jacket, Alice+Olivia Izzy cardigan, Marc Jacobs Boots, J Brand Photo Ready skinny jeans, Louis Vuitton Alma handbag, and Fendi's "Strangie" Bag Bug (I luv Buggies! ).